Cobb PARKS is offering a new program called Pickleball and there will be an exhibition 10 a.m., Tuesday, April 8, in the gym at Fullers Recreation Center, 3499 Robinson Road, Marietta. Pickleball ambassadors will demonstrate the very basics of the game. Open Pickeball sessions will begin at Fullers on April 14 and run 10 a.m.-3 p.m., Mondays-Fridays, through May 30. 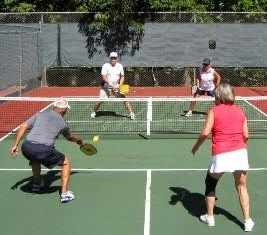 Pickleball is a simple game designed for all ages and any athletic ability level. The game combines elements of badminton, tennis, racquet ball and ping-pong, and is played on a badminton-sized court. It is played as a singles game or doubles game.